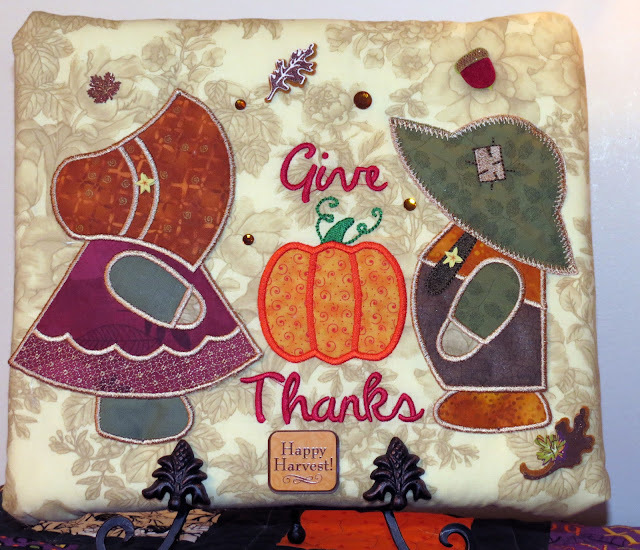 I'm so excited to be part of the Fall Machine Embroidery Blog Hop. Sit back and grab a cup of coffee, this is a LONG post. I love working with digital files and machine embroidery. I also love doing things the easy way too! I'm a hobbyist and not a professional and I love creating items to give away or sell for charity. If I can put less stress and pressure on myself, I'm all in. The quicker and easier things are, the better. You are seeing the picture. That's why I also like the AccuQuilt Go and fabric die cuts. 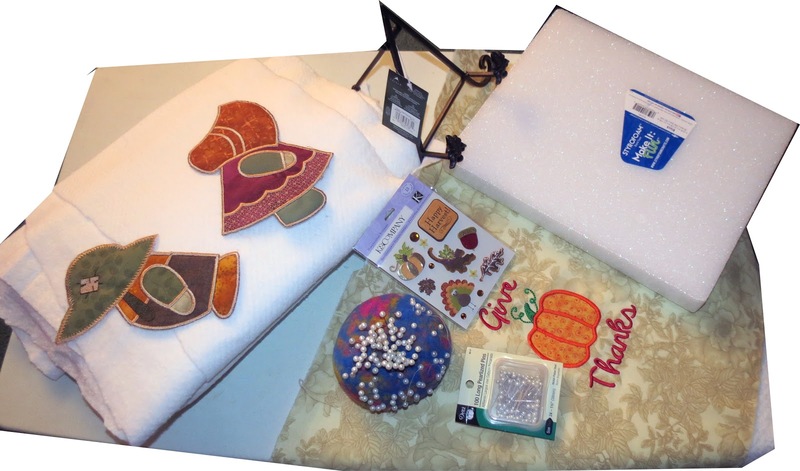 When I saw Marjorie's shop at http://shop.b-quilts.com/ and all the beautiful Die Cut and AccuQuilt Go Machine Embroidery Files, I thought it was great find and count me in. When I reviewed all of her files, I was drawn to Sunbonnet Sue and Overall Sam. I recently purchase the AccuQuilt Go templates so I was excited to put them to use. I've just found a new obsession thanks to Marjorie! For today's blog hop, I'm pulling Sam and Sue off the fabric quilt blocks and creating my Sam and Sue for unconventional uses. You never know, your children may make them their new Flat Sue and Flat Sam. No one knows, where they will be photographed next. I can see future posts on new versions so I've added a new category for Sam and Sue on my blog! So sit back, grab a cup of coffee and enjoy! 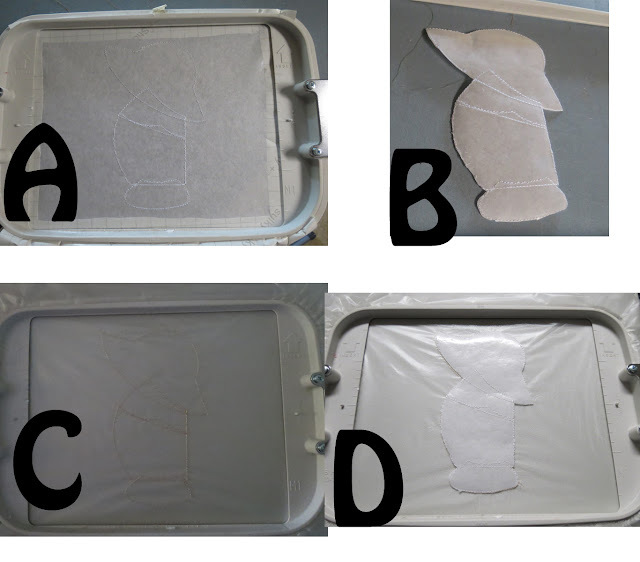 If you are going to applique for a quilt block, try and cut the quilt block fabric larger than needed and then you can center the applique after the machine embroidery is completed. This way, you are guaranteed to be centered! Consider making your machine embroidery pieces as free standing appliques and then sew, glue, or iron them on to their destination. I love using sticky back tear away stabilizer. It works well with making applique machine embroidery pieces. It sometimes has little fuzzies around the edges so sometimes I combine it with water soluble stabilizer. 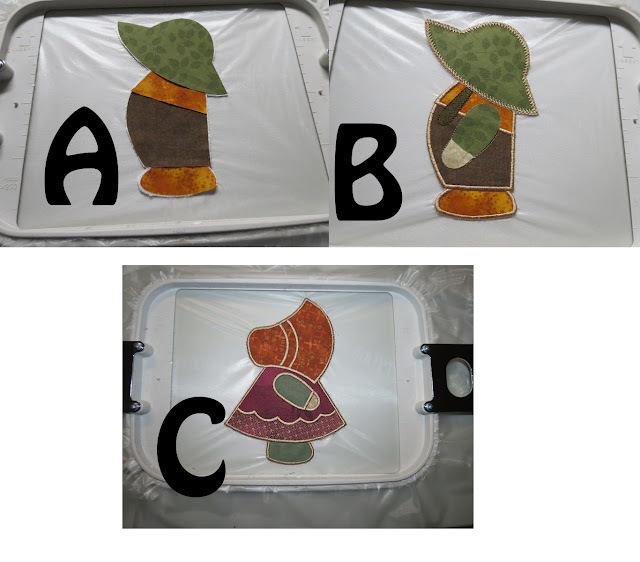 Don't worry If you don't own the AccuQuilt Go Sunbonnet Sue and Sam, Marjorie's excellent instructions also come with a printable template for the pieces! Here are the dies used as well as my Fall fabric choices in the cut pieces. As mentioned above, I like the function and stability of the sticky back stabilizer but I don't like the feathered edges it sometimes produces when you pull it away from an embroidered piece. So, sometimes I go the extra step to stitch out the template outline on the sticky back stabilizer and then I cut it out in one piece cutting directly on the sewn outline (See Steps A and B below). I then redo the first step of stitching out the template onto wash away stabilizer. Where the outlined it stitched on the wash away stabilizer, I then place the sticky stabilizer "cut out" within the lines. (See steps C and D below) I use some temporary adhesive spray to keep it in place. Then I add the fabric pieces as instructed. Once the file have stitched out, now comes the fun part. Even though I used the combination of Sticky Back stiff stabilizer and wash away stabilizer, it's really the wash away stabilizer that's keeping Sue and Sam on the hoops. Once I take the stabilizer out of the hoop, I just give a little tug and it starts to separate easily from the wash away stabilizer. If you would prefer, you can follow the instruction for the wash away stabilizer and use water. Again, quick is good for me. You can see the freed Sue and Sam below. Also, a photo for the back of the stitch outs. You can now see the sticky back stiff stabilizer. This helps in giving Sue and Sam some structure! 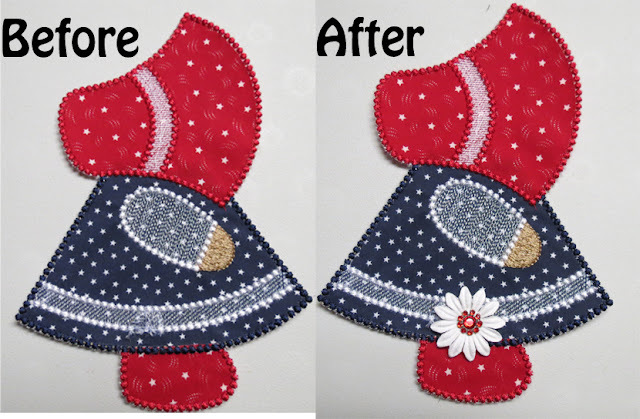 Obviously, you can applique them onto fabric either using fusible webbing or stitching without having to worry about whether it's centered or not. I used mine in two different ways. I added mine to a foam core square covered in batting and a fall embroidery design. Here's a snapshot of the items used. If you would like step by step instructions, let me know. It really was just wrapping the foam core with a couple layers of batting and pinning it in back. Wrapping that with an embroidered design centered in a lot of excess fabric and pinning to the back and then adding Sue and Sam along with embellishments. I had so much fun creating the Fall Sam and Sue that I couldn't help but go back to stitch out another set using Marjorie's other layouts for Sue and Sam. This time however, because of a cantankerous bobbin and temperamental top thread, I had one heck of a time on Sue. This is exactly what I meant with just relax and most all things will work themselves out. Look at the mess I created with the bobbin thread and breaking top thread. This was totally my machine's fault and nothing to do with the beautiful embroidery files. But, if you use a little creativity, you can fix anything. Here is the Sunbonnet Sue before the bobbin and top thread fiasco on Sue's decorative dress border and then after. 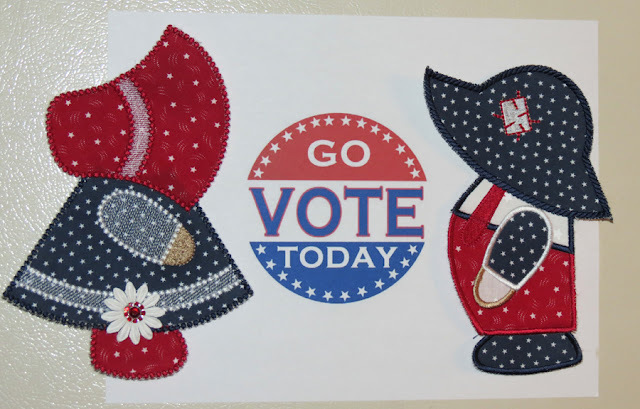 And after I finished the Sam, I added few magnets to the back of Sunbonnet Sue and Sam and here's the great reminder I have for everyone today!! Right now they are on my fridge, but they are moving to my filing cabinet at work today! Are you still here? Wow, THANK YOU! As a thank you, Marjorie has agreed to give away one design set of the winners choice from her collection of machine embroidery designs (http://shop.b-quilts.com/) All you have to do is enter a comment and let me know what you would do with your flat Sue and flat Sam for one entry. If you would like another entry, please become a friend that follows on the top right. After you do, please leave another comment that you now follow. If you are already following, please leave a comment letting me know as well, I'll pick a winner from all the comments on Friday morning. Entries on this blog entry can be made until Thursday at midnight EST. Be sure an visit Marjorie's Shoppe and look at all the options available! Thanks Marjorie! I love your project and creative ideas. What wonderful ideas - and now I know what to do with all those "sample" stitchouts that my grandchildren love - their whole room will be covered in ME magnet motifs - or I can add some felt on the back and make them into 'paper dolls'. My bobbin acts ugly sometimes. Love your solution for saving the ME. That would be a great use for orphan buttons too. I really love Sue and Sam! I live in the Netherlands, and would make Sue and Sam from Dutch fabrics...like Delft blue, and ofcourse with a tulip and windmill. Thanks for showing your entry! I think they would be great on a little toto bag! Thanks for this info on embroidery. I have yet to use my Janome for this because I'm not sure on doing all this. This info will be helpful! Sue and Sam would have to go on a bag that mom could use to carry "needs"! They would be utterly perfect on a small throw for the grandchildren. Very fun. I love to machine embroidery and I enjoyed your process. Refrig. magnets is what I'd use Sue and Sam for. We just had #9 grandbaby yesterday so my refrig will be filled for years to come with all those special art works. I think it would be fun to make separate hats, dress, shoes, pants, shirt. 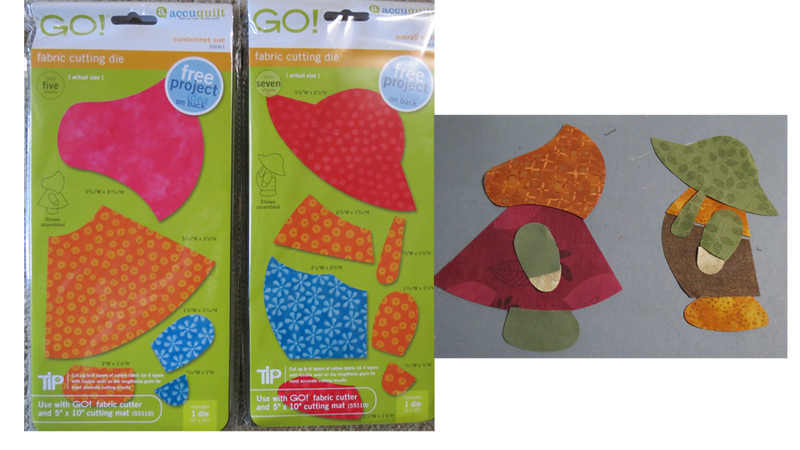 Then attach magnets or leave plain and use a flannel covered foam board and the kids could play 'paper dolls' and mix and match outfits. I can totally see them doing something wild and crazy for Christmas - gorgeous embroidery. I am just starting to "play" with my embroidery machine so am finding loads of great information on this hop. Thank-you so much for sharing. Marjorie is the best!! She does great work and I so enjoyed seeing how you use your designs...so creative and thanks for the tips! I love Sunbonnet Sue and Sam! Would use this die set for a quilt- have a couple of dozen Sue and Sam machine embroidery patterns fro Embroidery Library and these appliques would make the PERFECT quilt corners! Trish, this is so much FUN! I especially love your idea about turning the designs into magnets. My grandmother used to have some beautiful handmade felt and sequin seasonal decorations on her refrigerator when I was a little girl -- I remember the Mr. & Mrs. Santa Claus vividly -- and now you've given me an idea of how I could make something like that for my own family! I also love how you covered your "oops" with a flower. 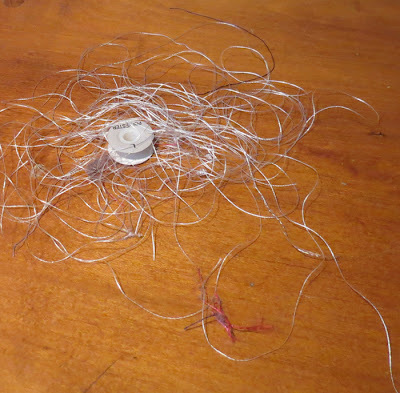 That looks so good, I would do it on purpose next time even if you didn't have a bobbin thread fiasco! Great tips, tutorial and inspiration. Love it. I also really liked how you used the water soluable stablizer. I'll have to give that a try. Your Fall project is so very cute. I definitely want to make this. Thanks! I like to put appliques like those on towels or potholders, as I would use them in the kitchen and get to admire them on a regular basis! I think I would make a doll quilt using them. Thanks for your blog post. I would think the Sue and Sam would make a cute wall mini wall quilt for a childs room. Estupendo tutorial. Estoy deseando ponerlo en práctica. Gracias. Ya soy seguidora, no quiero perderme nada más. Creo que unos almohadones para los niños quedarán muy bien con Sam y Sue. One fun idea you could do also is to get all the pieces cut out and then stitch them onto a very stiff stabilizer and following the part of your tutorial to make them stay as one piece but using a skin colored fabric or patterend fabric if you wish. Next you would cut out and make additional pieces using many different fabrics. On all the additional pieces however you would use a much lighter stabilizer to make sure all parts stay together and then as a last step, place a solid piece of fabric on the back using whatever fabric you want to use so you're covering up the bobbin threads. Once it's all completed with the backing fabric, you can put a small piece of Velcro or use Aileen's Tack it Over and Over on each of the additional pieces created and also on the front of the stiff 'naked' ones. When done you will have paper doll Sunbonnet Sue and Sam Dolls with those addtional pieces you created being their clothing. I'm already a follower also. Thanks for the great idea to 'free' them and info on fixing a boo boo too. I would create a stuffed doll with the appliques and put them in a shoe box and wrap it for Operation Christmas child. I would make a wll hanging of sue and Sam to illustrate the seasons - for my daughter,s room at the nursery where she works She loves the things I make to brighten up the daycare facility. Now a follower - great to find your blog and your tutorial is so clear and helpful Not enou blogs about machine embroidery as far as I am concerned! Thanks for explaining your method. Although I have used water soluble stabilizer, I never thought of using the way you did. It's a great idea. 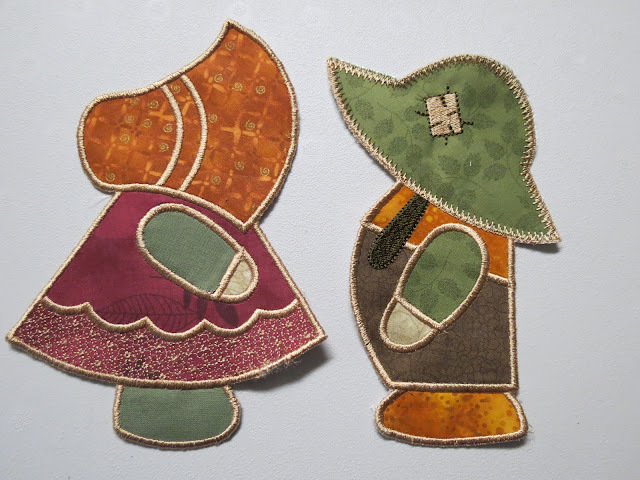 I love Sunbonnet Sue and would put her on the tote bags I make and fill with toiletries for the local Women's Shelter. Sue's been around for a long time and under that cute little country exterior, I suspect she's a pretty tough broad. I think she would make the ladies at the shelter smile. I'm a new follower. I really enjoyed going back through your previous posts. I particularly liked the small stained glass wall hanging you made. Well, this was interesting. One of my Grandaughters loves Flat Stanley, and her Daddy has taken him to several Asian countries. 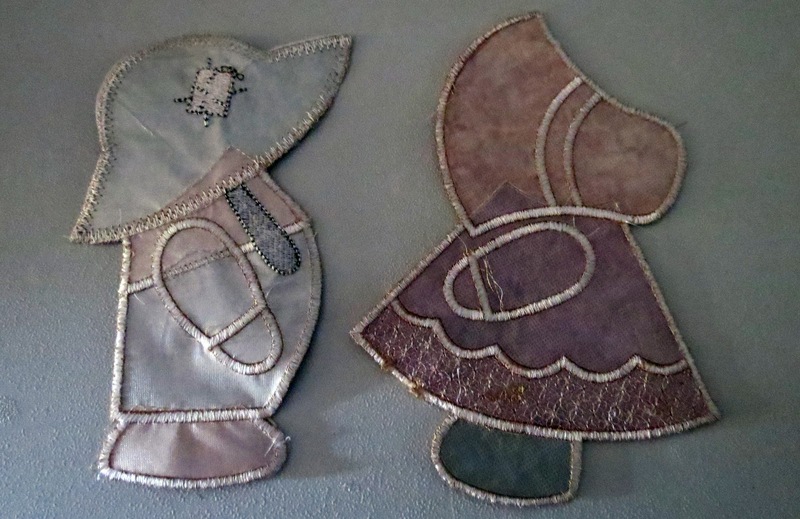 I have a Sundbonnet Sue Quilt that my Grandmother made for my wedding 42 years ago. Lots of memories. Maybe a Flat Sue would fit in perfectly in our family. I would put them on a child's quilt for our church quilt ministry. Thanks for the chance! I just so appreciate all the great information you have shared. What a hard act to follow! Terrific post and ideas..Thanks sew much for being part of this Blog Embroidery shop hop. I love the pair dressed in the red/white/blue, and you can use them for several National Holidays. Thanks again. I'm now a new follower of your blog. I love the stars die! Thank you for your excellent tips! Kelly sent me over~ and I just wanted to say, I love your ideas! have a happy weekend!